Re: My reasearch about Hlog and cenzorship on forum.kitz.co. How much are you willing to pay? I'm sure there are some experts in the field that would gladly help you - usual rate I would guess is somewhere over £1500 per day. What you seem to be doing is insisting that experts with deep technical knowledge should help you solve something that is causing no issues and to provide that help for free. It appears nobody either has the knowledge or the will to help you on that basis. Offer to pay their time at the going rate and maybe someone out there with the right experience would offer to help. have done significant progress and I believe if somebody with very deep technical knowledge will be cooperating with me it is possible to discover a kind of impairtment wihout JDSU or similar tools. Highly unlikely. You've been posting your unusual Hlog for about 5 years. There's a reason why engineers carry a JDSU. Your ISP won't send an engineer because your service works, perfectly. None of us know the make up of the telephone network in Poland or the type/gauge of cables used. We have no idea how the history of telecoms has evolved over the years in Poland and what short-cuts they took comparable to using Aluminium in the UK network. Furthermore I think my recent activity was not asking questions. I have being explaining my observations to burakkucat and other forum users. It is frustrating they continously don't see things which I see. That's life. Not everyone is going to agree with you on everything. Getting frustrated about it won't help. You need to stop obsessing over your Hlog. If you must obsess over it, I recommend you find another place to do so. There once was a boy from Poland. Highly unlikely. You've been posting your unusual Hlog for about 5 years. And I've done significant progress. Unfortunately I have not a deep knowledge about transmission lines theory and thereby I've note explained all issues related to my Hlog. I have collected a lot of datas and I believe it is possible to discover a type of impairtment causing my unusual Hlog. It is a reason why I do my own research. As I know there are no significant differences. It's really sad that these people (I can think of others) get so obsessed over something that ultimately they can do nothing about, something that has no impact or minimal impact becomes an obsession which takes over their lives, and they unwittingly try and drag others down with them. Very sad, theres far more to life than hlogs and broadband. It's really sad that people are not interested with knowledge for itself. Unfortunately I've met nobody with scientific passion to xDSL technology. Perhaps "knowledge itself" about xDSL is not as important to the rest of us as it is to you. What is your interest in classical music between the 12th century and today? In particular Polish composers' music and biographies. For example Chopin, Penderecki, Lutoslawski, G�recki, Panufnik, and Syzmanowski to name the most famous. I enjoy the music of all of those. As an EU citizen, do you know without looking it up or asking someone, who wrote the music that is the EU's "state" anthem? I do and expect several posters here do. Have you visited Mozart's and Schubert's birthplaces and Mozart's huge apartment in Vienna? I have. Have you stood in awe in front of Monteverdi's tomb, stumbled across by accident? I have, and shall never forget it. Have you read any of these by Polish authors? I haven't. What do you know about astrophysics. Are you at all interested in the Parker Solar Probe? Do you even know what it is? Have you started any threads anywhere about the nature of dark matter? Do you know what that is? What about quantum theory, and seeing as you are so keen on xDSL theory what about quantum computing? Get real. Your broadband works. Use it to gain "knowledge itself" about the world as a whole. Don't expect those of us interested in other topics to want a deep knowledge of esoteric variances in your broadband when it doesn't even deleteriously affect the service you get from it. The people you want will be working in the research parks at Universities or for the operators working with chipset manufacturers. For a rate of �1500 a day am happy to sift through the data and being frank unless you have a real service impacting issue that is what the answer will be in many quarters. Basically he wants you to be able to identify from a simple hlog graph where there may be some slightly non perfect piece of copper/joint or miniscule defect on his line and what point. Whilst someone with a trained eye may be able to see that there may for example be a bridge tap and even give an approximate length of the bridge tap from hlog. What it is impossible to determine from a single 2 dimensional graph, is where the problem is in the network. His claim is that someone will be able to figure this out.. despite numerous technical documentation saying it isn't. Basically what he wants is the equivalent of a JDSU which can take several readings to build up an array of data, which then uses various algorithms to determine at what distance say the bridge tap occurs - this is not the same as length. What he wants is possible if he goes out an buys a JDSU or similar and attaches it to his line. However, he refuses to spend money on one, so expects someone to be able to diagnose this from simple hlog provided by his router. B*cat has already coded something which allows him to plot the cartesian co-ordinates, but he is now wanting moon on a stick to do something which is patented technology (for free!) so he can run it on his line. If by any chance someone was ever prepared to do this, then just what he would do with this info I've no idea, because his Telco won't do anything about it. FYI. Within the past week or so, he has been banned from 2 other forums (besides mine) that I know of. Thats not including the various other forums where he can no longer post or they also locked his threads/deleted his posts over the years. I'm quite honoured that he's only bitching about mine despite all the help he has been given. I think he expects us to read everything he has posted on your forum kitz, judging by the number of links in his OP, then add to what he has already been told. That's quite an amusing thought, in a way . I think kitz slightly misunderstood what I want. Basically I want to be able to identify type of impairtment causing this unusual hlog. Burakkucat suppose that it is caused by circuit consisting of many section of cables with different gauges. However I am not convinced this is explanation. Perhaps it is partial explanation if anything. Following there are reasons why I think this way. 1. According to my ISP my circuit is not consisting of many cables with different gauges. 2. I've discovered that some dips on my Hlog are caused by measurement errors. In this post I've explained this. 3. One day event weights against theory that this Hlog is caused by many sections of circuit with different gauges. I've noticed sudden reconnection and change of attenuation values at the time of pavement resurfacing works. 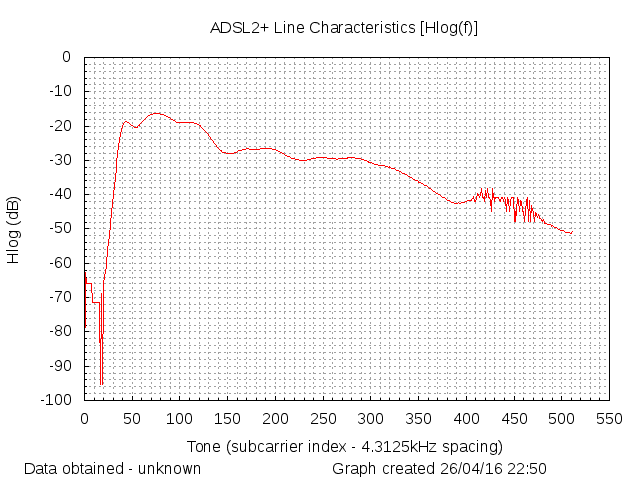 It was 23.5/20.2 dB instead usual 25.0/14.9 dB (usual on D-Link DSL-2740B). Probably more users were reconnected because I had SNR margin about 4 dB immediately after reconnection (instead 6 dB). Next day after that day I also had reconnection during pavement resurfacing work and attenuation came back to usual values. 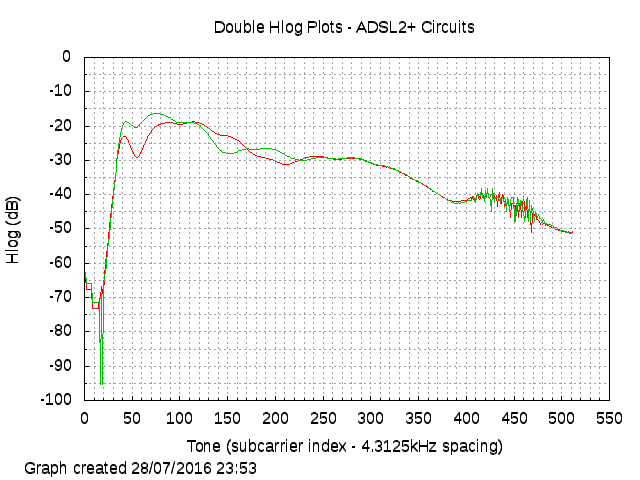 On day with unusual attenuation day Hlog was significantly different per some tones. I think some shock caused some ipairtment on some joint reflected signal differently than usually. Following there are usual and onedayhlog on one coordinate system. I suspect dip moved from tone ~210 to tone ~150. On other forums there is censorship. It doesn't mean that it is good. I am sorry that I've proved myself person harassing burakkucat and other forum members. Indeed, moderators have been asking me to not write "burakkucat: what do you think?". However I have thought moderators exaggerate. I have believed that my research benefits both me and burakkucat. I thought burakkucat is interestes with my posts however sometimes forget about theirs and thereby it is OK if I remind burakkucat of some unreplied post. I am surprised my posts have been so very uninteresting. My Hlog is unusual and I have thought that burakkucat also would like to know what is cause. Ban for putting people on pressure would be OK. However it is not OK that my thread was locked. I have wanted to explain why I think burakkucat is wrong emphasizing that I understand burakkucat is not interested with my explanation but I will explain it for potentially interested other persons. I got ban after I protested against censorship. I don't say harassing other forum users is OK.
No. I have summarized my discoveries in this post.